This entry was posted on December 31, 2011 at 1:00 PM	and is filed under Uncategorized. You can follow any responses to this entry through the RSS 2.0 feed. You can leave a response, or trackback from your own site. 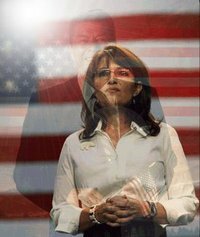 Well, if Sarah Palin does not run for President; the least she could do would be to serve as Secretary of Energy in next President’s cabinet! She would do an excellent job in that cabinet position. The person I see as most equipped who clearly understands this sad state of affairs has elected to not seek the leadership role at this time. It is the duty of conservatives to prepare the way for Sarah Palin to make the changes we need . . . clean up the House, the Senate and the bureaucracy whiich is making a mockery of our way of life and our Constitution! We may not be “in love” with any of the candidates for President, but we must work for the right kind of representation in the House and the Senate. Representation that will set a budget, stick to the budget and cut out wasteful spending, bloated bureauracy and staffing, special interest serving lobbyists and elected officials with an agenda not compatible with the Constitution of the United States. We need to find people who believe in American exceptionalism for what it is . . . liberty for ALL!